Spacesaver High Rise lifts can be used as personnel work platforms, as cargo lifts between levels, as mezzanine lifts, for automated palletizing systems, and for positioning test apparatus or tools. 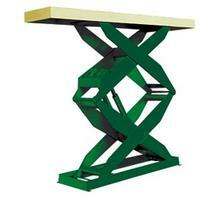 These lifts are available with vertical travel up to 12 ft. Capacities range from 1,000 lbs to 12,000 lbs. High rise with minimum floor space. Extremely stable. Loads to 12,000 lbs Vertical Travel to 12'. Note: If you would like a custom size or require a lift higher than 116" - please call ZORIN (888) 378-6525 to get pricing.